Our Swimming Pools are truly the most energy efficient!.. Our pools operate using less energy and are less expensive to maintain! Those benefits will result in providing you measurable savings, that will pay in dividends over the life of your pool…Please read on to learn how this is accomplished. 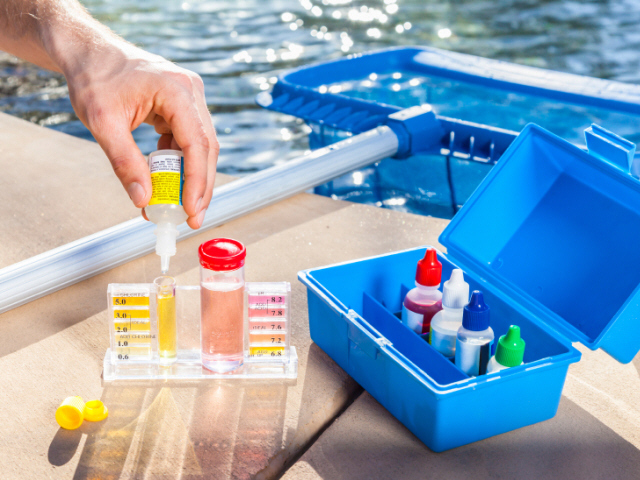 The Swimming Pool Industry’s historical practices in some cases, have resulted in neglecting to employ the best practices for maintenance operations. 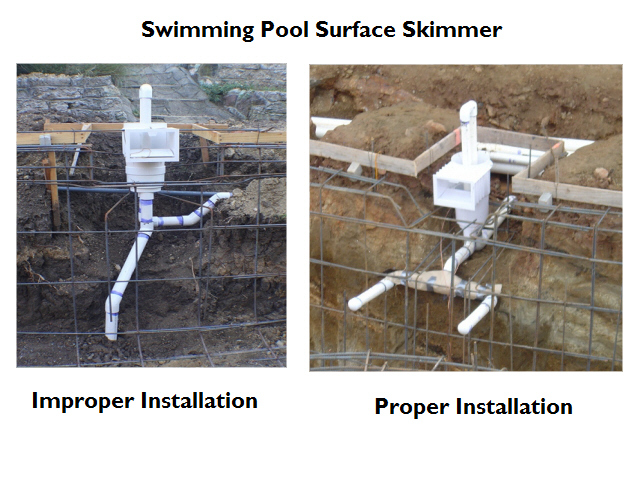 These installation practices will set the stage for how your pool can be efficiently managed. 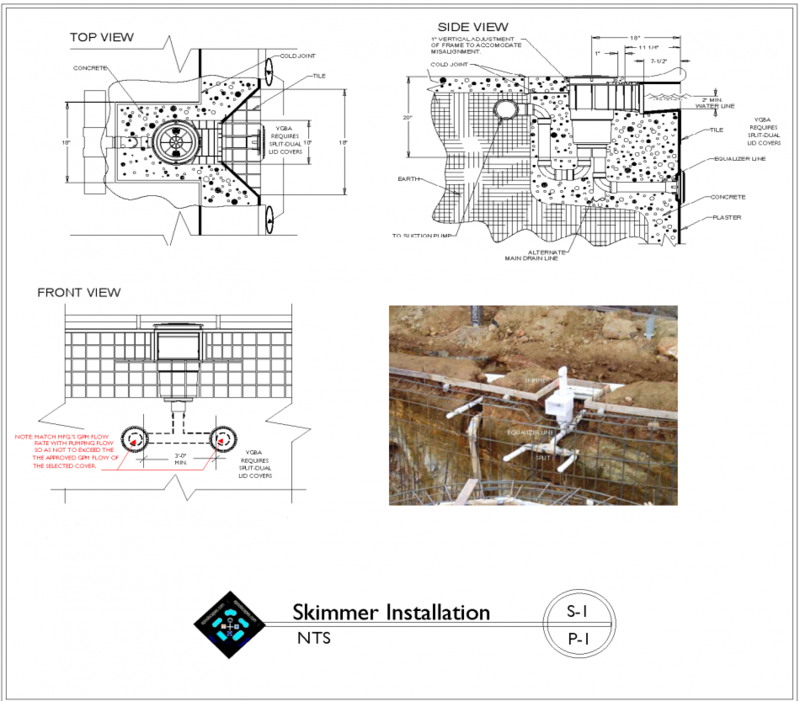 The images below are examples of what can happen when a SKIMMER DEVICE is plumbed in a fashion that makes the MAIN DRAIN exclusively dependent upon a single suction pipe Skimmer / Main Drain function. 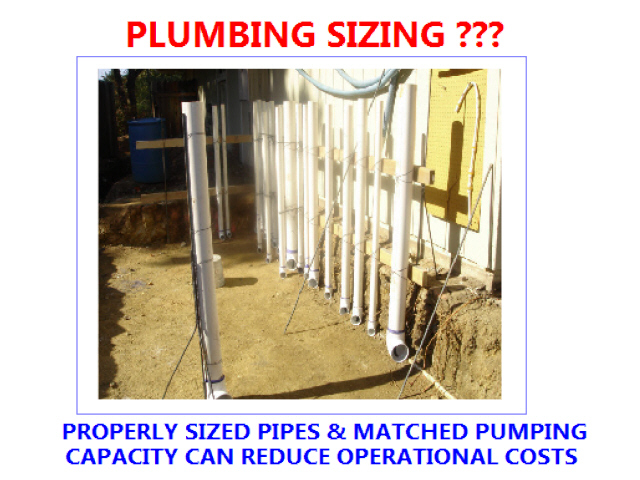 This “dumb plumb” practice is cheaper for the Builder to build but, it can cost you $1,000′s more in energy and chemical costs, over the life of your pool! 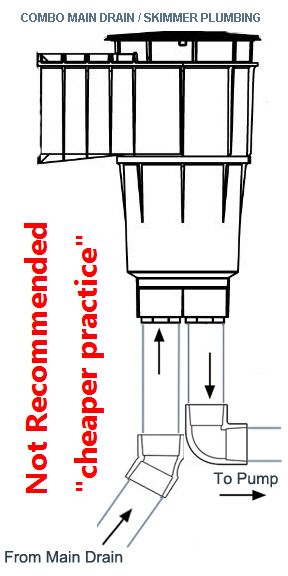 The intended operational function of the “Skimmer” is to provide for a surface suction for the pump’s intake. 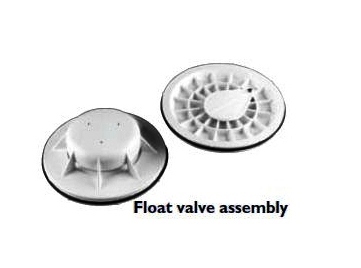 This device is to work in conjunction with the pool or spa’s “Main Drain” device. 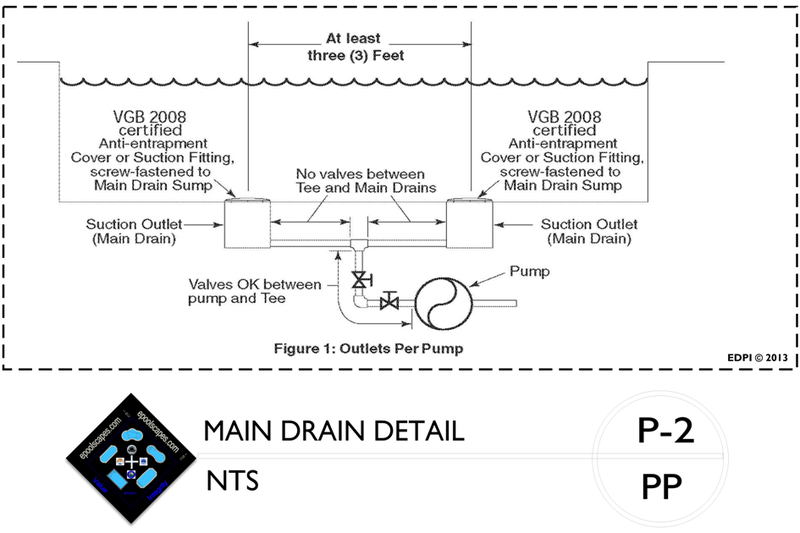 It should be “plumbed” separately, in order to provide a capability for making adjustments to the pump’s intake flow. 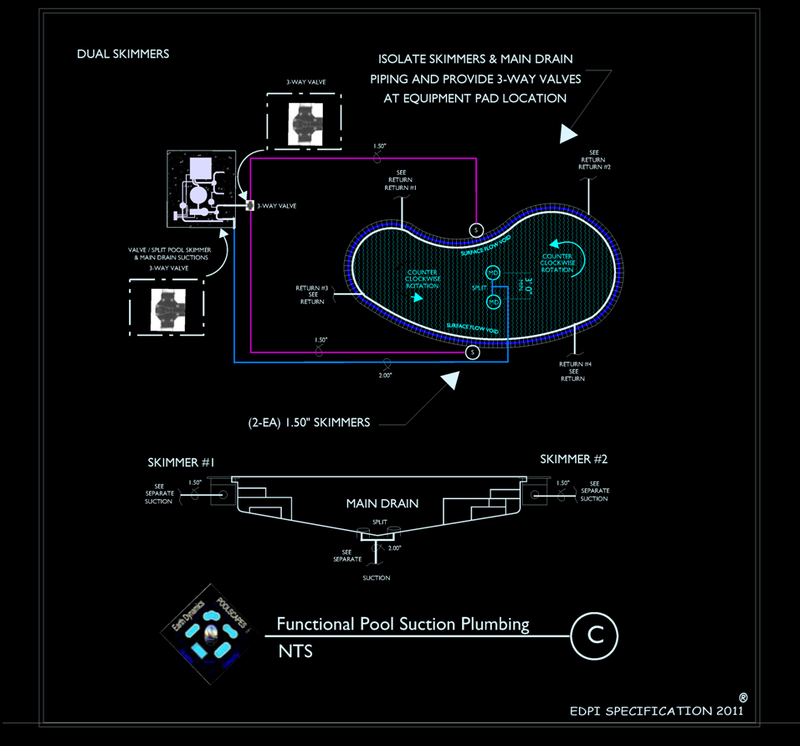 The pool’s suction intakes needs to blended the heavier chemically treated water that sinks to the bottom of the pool with the surface water that floats toward the top, in order to provide a better balanced chemistry. 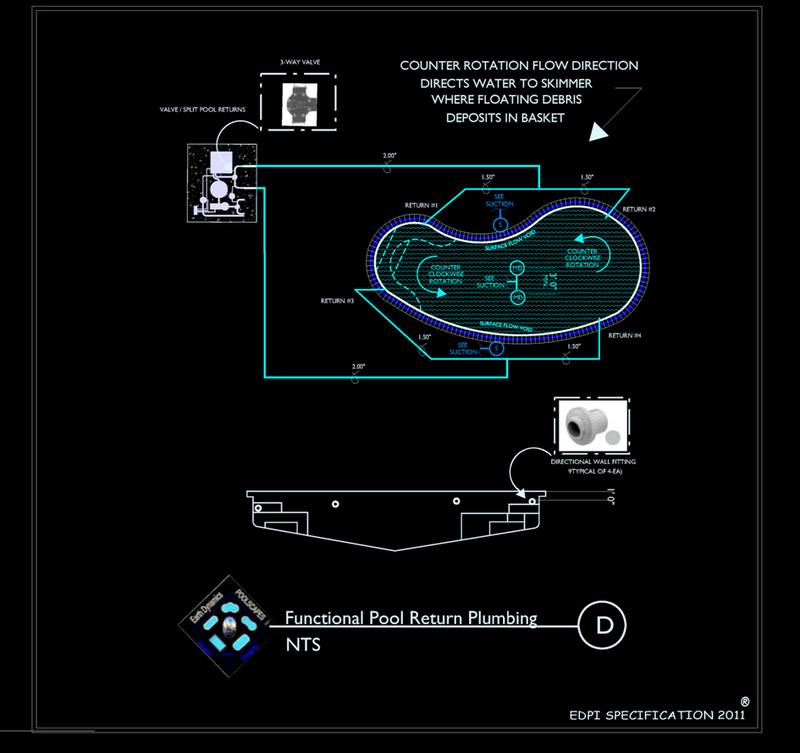 The pool’s plumbing system needs to provide the capability of making distribution modifications that are necessary between the chemically treated water that will typically settle on the bottom of the pool and the lighter water that will stay on at the upper levels. When pools are built with a cheaper plumbing system, they will cost more to maintain and they will cost more in repairs. 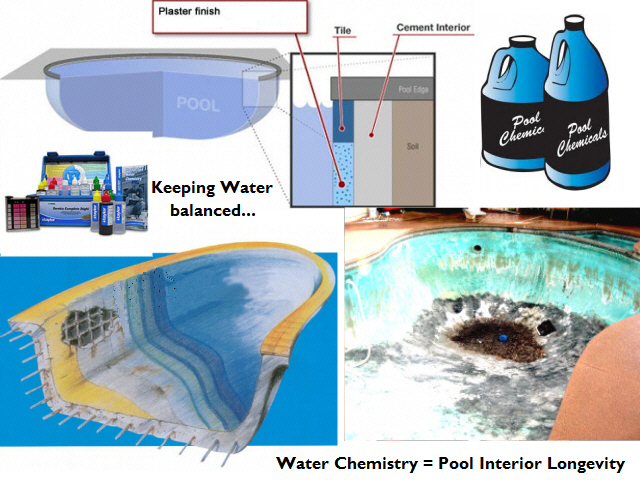 If the filtration system can’t provide a balanced water chemistry, then the plaster, tile grout and any other concrete products that are made part of the pool and that come in contact with the pool’s water will suffer. 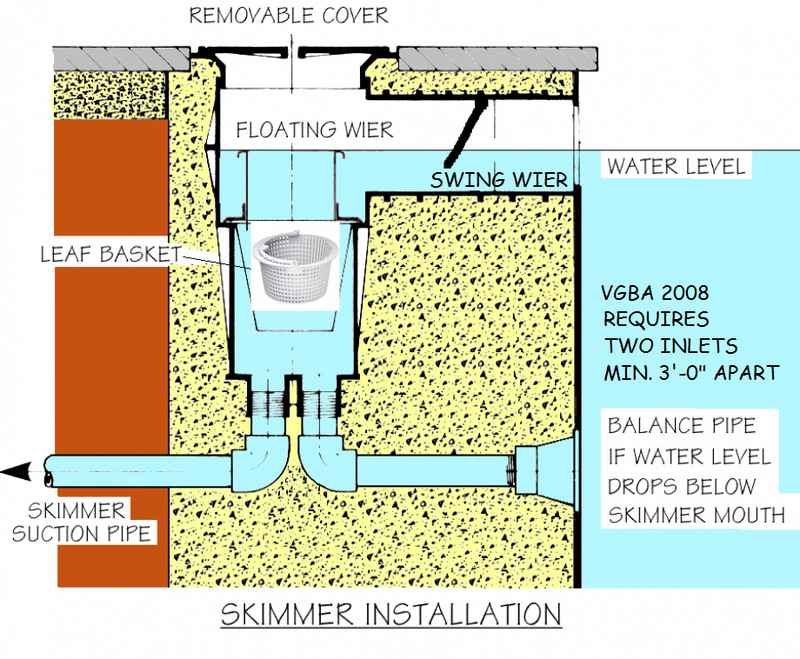 The importance of Skimmers and Main Drains are to provide a control capability for keeping the water chemistry balanced and achieving a pool water volume turnover in a 6-hour period. 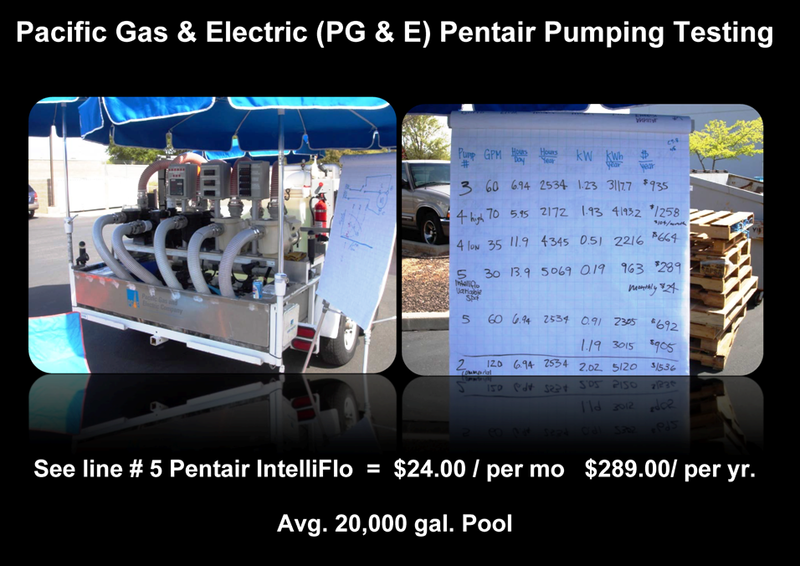 Of course the biggest energy consuming component, is the Filter Pump but, when building an energy efficient pool, the energy efficient pump savings, can quickly become negated as a result of everything mentioned thus far! 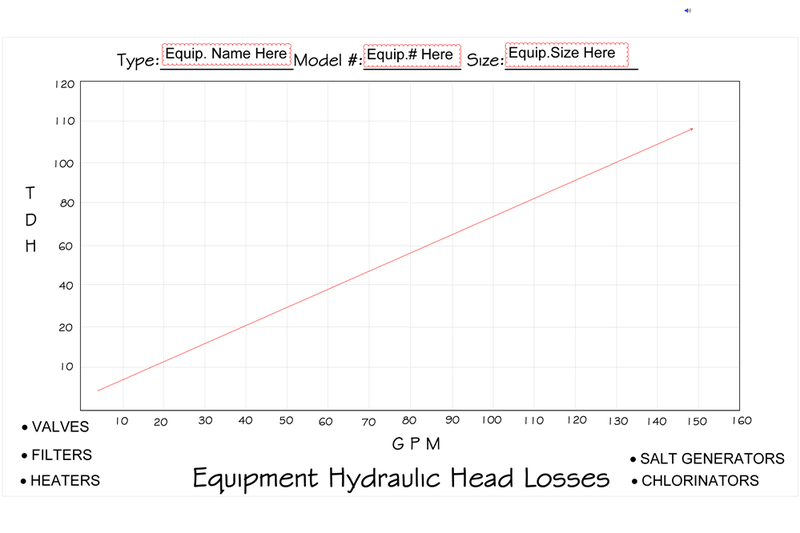 In the next photo image, you will see an example of a Hydraulic Head Loss Chart” and depending upon how well the overall pumping system is designed and ultimately installed, the speed factor will determine how efficiently the electricity is being consumed, that of performing the task of water filtration. This is very much like the fuel economy in your automobile. At 55 mph you will get better miles per gallon than traveling at 75 mph. 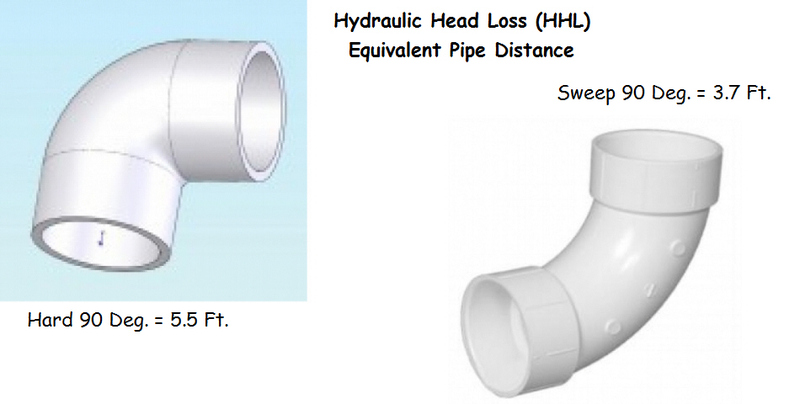 In the auto, it’s wind resistance and in the pipe it’s the greater “Head Loss” when the water travels at higher velocities! 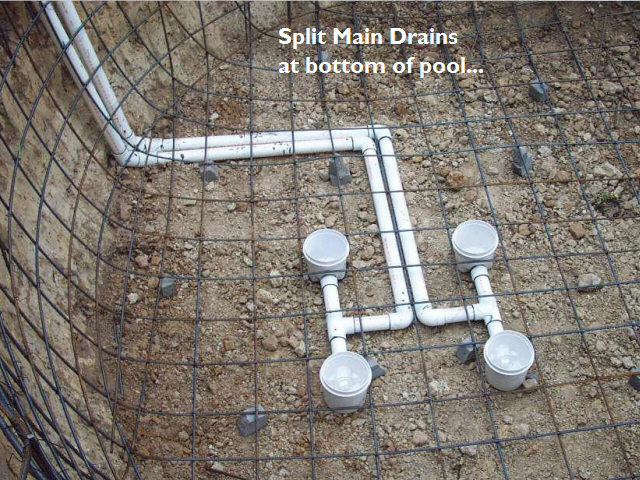 This is often like the thief in the night, costing far more over the life of a pool, than the little difference that it may cost to build it correctly, from an energy efficiency perspective! Accomplishing much of this isn’t a part of a typical Building Inspection’s critique for residential installations so, you’ll want to make sure that you are aware of what you are buying! 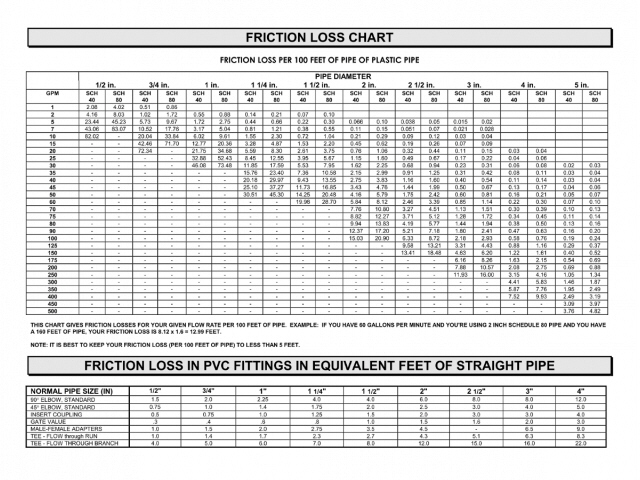 Although the 2008 California Title 24 Standards get inspected by most agencies now, they still fall short in considering the effects of Hydraulic Head Losses or Water Balancing on energy consumption, as part of the guidelines being recommended. The premise of this statute is that the 90 Deg. Hard verses Sweep Elbows could hypothetically give cause to reduce the average swimming pool’s filtration cycling time, by approximately seventeen minutes per day! The California Department of Energy has requested all agencies to impose some nonsensical mandates such as, “HARD” verses “SWEEP” 90 Deg. Elbows but, refuses to recognize, as of yet, the water velocity as the real culprit to achieving a meaningful accomplishment toward energy efficiency! The lunacy in such a premise is that the supposed concern is for excessive Hydraulic Head Losses in Hard 90 Deg Elbows, while the Energy Department officials are still allowing excessive pipe velocities (6 fps suction / 8 fps return) that cost the HHL equivalency of hundreds of 90 Deg. Elbow’s! 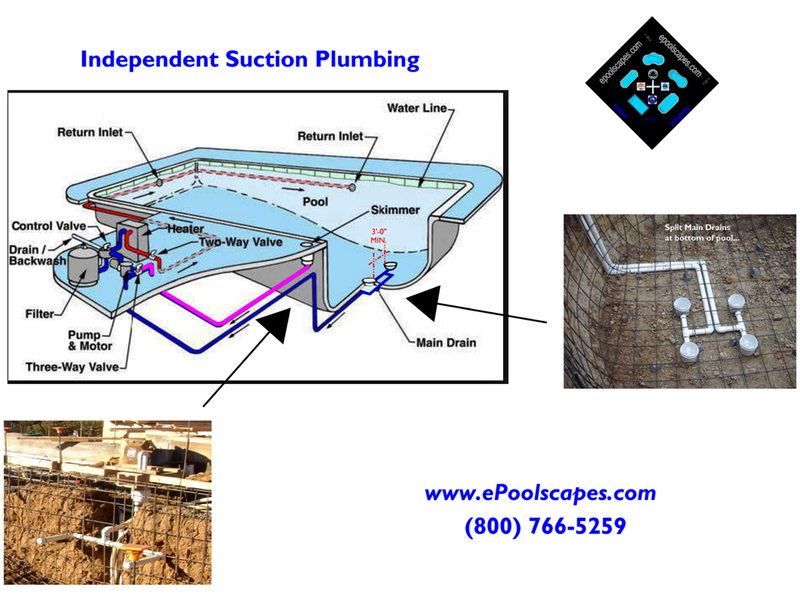 Our design flow rates are 5 fps for both suction and return lines and although these considerations aren’t mandated, they save our customers 1000′s over the life of their swimming pool. If you have reached the end of this page, then you will have been made the beneficiary of a portion of our gain knowledge and experience! Of course the costs for constructing a swimming pool or spa to these standards, will have more upfront costs but, the long-term costs in lost time, energy and the inconvenience of an accelerated decay, will net greater losses over the life of your pool. If you are looking to build quality 1st, and equate the value of a price, in that of the substance of measured returns…Well please give us a call and allow us to assists you in planning for getting the greatest enjoyment in owning a swimming pool, while receiving the greatest return for your dollar!